When I read Anne Lamott’s Bird by Bird: Some Instructions on Writing and Life earlier this year, I found a plethora of writing truths in that amazing book. Not the least of which is how she describes stories’ first drafts. Now, I want this to be a family friendly blog, so I am just going to paraphrase and call them “crappy” first drafts. But I think you get the idea. And Lamott is absolutely right. I don’t want to let the wind out of your sails, particularly if you’re enjoying NaNoWriMo like I am right now, but what we’re writing – what we always write the first time around – is full of all kinds of garbage that should be burned on the cutting room floor. And good riddance. But that doesn’t mean this material doesn’t have its place. I have said before that I am terrible about starting a new story but then losing my enthusiasm and fizzling out. I have many half-written novels that may never see the light of day. NaNoWriMo presents quite a different challenge, one that has forced me to be productive in a way I never thought possible. When I started last Friday, I had about a page of notes jotted down and several fully-formed scenes already bouncing around my head. Although one piece of NaNo advice that I read was to write a chapter-by-chapter outline of the whole book, I am not a big fan of giving myself such restrictions. 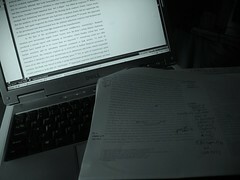 Instead, what I did that first day was to write at least a portion of each of the scenes that were so vivid in my mind. Each received a brief, descriptive subtitle, which I’ll delete when I fill in all the scenes in between, and as I wrote, the shape of the story began to develop. Anything I was afraid I would forget I jotted in my notes. Then, after the first three days or so, during which I typed like mad and had to force myself to go to bed every night, I hit my first challenge: writing those in between scenes. These connect the major events of my story and include many details that are important for me, the author, but probably aren’t fun for people to read. These expositional outpourings are a big part of what make first drafts so awful. I can’t tell you how many times my characters turn and look at each other, shrug, smile, and have awkward little pauses – made even more awkward by the fact that I wrote them to begin with. But as one friend pointed out to me, the important part about NaNoWriMo is writing. It’s getting the words on the page. Editing has its place, but that’s when the whole story is out. So far, at the beginning of day eight, I have written about 22,600 words. I remember when I blogged last week, I had little hope of even getting this far just because such concentrated writing was a new and intimidating experience for me. But knowing that I have only one month to complete my task has lit a fire under me that – even as a very self-motivated person – I’ve never been able to get myself to do. And it doesn’t hurt that self-publisher Create Space is offering two free, printed copies of novels for all NaNoWriMo winners. I have the feeling my novel is going to well exceed the 50,000-word requirement to finish, so my goal is to actually make it through my whole book, no matter how many more words it takes. Then, I’ll take a deep breath and read it. I’m sure I will cringe a lot and pull out my ax. Because even if every first draft is a crappy one, I would like to at least have something a little more respectable in print, even if I decide to hide it in a drawer forever. So if you’re writing and feeling discouraged, if you know that the scene that gets you from point A to point B is really rough and will need fine-tuning in the future, write it anyway. And if you still feel doubtful, I’ll leave you with more wise words from Anne Lamott: “The first draft is the child’s draft, where you let it all pour out and then let it romp all over the place, knowing that no one is going to see it and that you can shape it later” (22). This entry was posted in Writing and tagged Anne Lamott, Bird by Bird: Some Instructions on Writing and Life, First Drafts, NaNoWriMo, Writing. Great summation of your experience so far as it relates to Anne Lamott’s advice. I might try NaNoWriMo next year. I’m doing NaBloPoMo right now, and it’s a good experience. Wow! That seems a lot more daunting than NaNoWriMo–good luck! I’m glad it’s going so well for you. You’re ahead of the game, so if you hit that dreaded second-week slump, you’ll have a bit of a cushion to help you stay on track. I’ve hit it early this year, but I will not let it defeat me. Your blog just gave me some very helpful reminders. Thank you!